Check out this little Posy Sock Sack I received in the mail Friday from Knitnana at Nana Sadie Rose. Isn’t this just the cutest thing? I don’t live in Vermont or Wisconsin, but I do love cows. Which is maybe a little strange, now that I think about it, because my Mama was terrified of cows. She told me once that when she was a little girl she used to have nightmares about her neighbor’s cow, Bossy. In Mama’s dreams, Bossy, with gnashing teeth and flared nostrils, was chasing her across the field. And Mama knew, in her dream, that if Bossy caught her she would be eaten. Some cow, eh? Wonder if Bossy’s milk was pre-curdled? But I digress. I love cows. And so when I saw this bag over on Knitnana’s blog I immediately emailed and asked for one just like it. 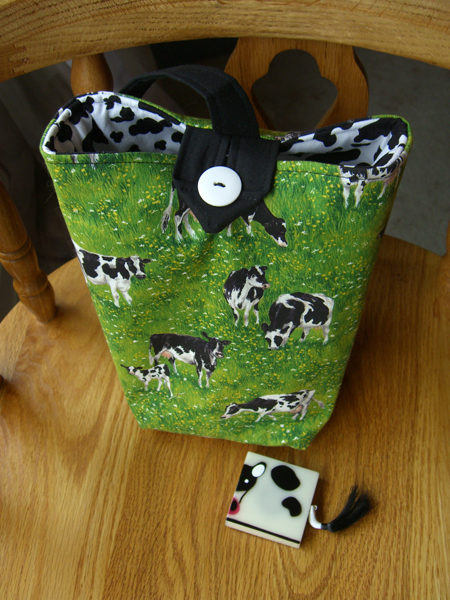 And doesn’t one of my mini-herd of little cow tape measures look just perfect with this bag? In the picture, you can just see the interior fabric of the bag. Yep. It’s cow spots! And flannel, so it’s soft on needles and accessories. Inside there are four slim pockets for DPNs or crochet hooks, and a larger pocket that’s perfect for Little Cow. The Posy Sock Sack is just the right size for any small project — socks or mittens or a hat. It has one strap that can be slung over your shoulder like a backpack. And it’s washable. What more could you ask for? I would love to knit a shawl for my mother in law. Could you suggest a pattern and yarn for a first time lace knitter. Simple as possible, please. I would suggest something like Wendy Johnson’s Fir Cone Wrap pattern. This pattern uses the most common laces stitches, so you will get a feel for knitting lace. But it’s a relatively uncomplicated, over-all pattern, so it will be easier to see how the lace is actually constructed. It has a very nice garter-stitch border that is knit at the same time as the lace. Wendy knit hers from Seasilk, a lovely yarn to work with. But I would suggest substituting a wool or wool-blend for a first-time lace knit. Wool, because it’s has more give, is a little more forgiving than silk. It’s also not as slick and stays on the needles better. The blocked dimensions of this wrap are 25″ x 66″ — a pretty decent size for a wrap. But you could make a larger one by adding more pattern repeats. Go look at the chart included in the pattern (I’ll wait right here while you look). See how the middle section of the chart is a 10-stitch pattern repeat? To make your wrap wider, cast on more stitches. Just make sure that the extra stitches cast on are in multiples of 10 — 10 or 20 or 30. Then knit the 10-stitch repeat over those extra stitches every row. To make your wrap longer, repeat the 16 rows of the chart a few extra times until your wrap is as long as you want it. Remember that it will grow when you block it! Check the unblocked vs. blocked dimensions given in the pattern to see this in action. And wool will block out larger than the Seasilk did. For a really wonderful how to reference, it’s hard to beat Eunny Jang’s Majoring In Lace tutorial. It’s very comprehensive and covers lace from how to match needles to yarn, to how shawls are constructed. Cat Bordhi’s new book New Pathways for Sock Knitters: Book One, is being released on August 1st. Finally! I had the privilege of exploring a couple of Cat’s new sock architectures at the Magical Moebius Workshop I attended last spring. They are marvelous and wonderful and magical. I can’t wait to see this book and the two volumes that follow. Cat’s brain works in strange and mysterious ways, and I know that she has come up with wonders and adventures for sock knitters everywhere. Blue Moon Fiber Arts is hosting a little book reception for Cat at the World Forestry Center (over by the Zoo) on August 17th, 7-11 PM. That’s a Friday, but if you want to check your calendar, I’ll wait right here. If you are anywhere within striking distance, please plan on attending. I think it’s going to be loads of fun. 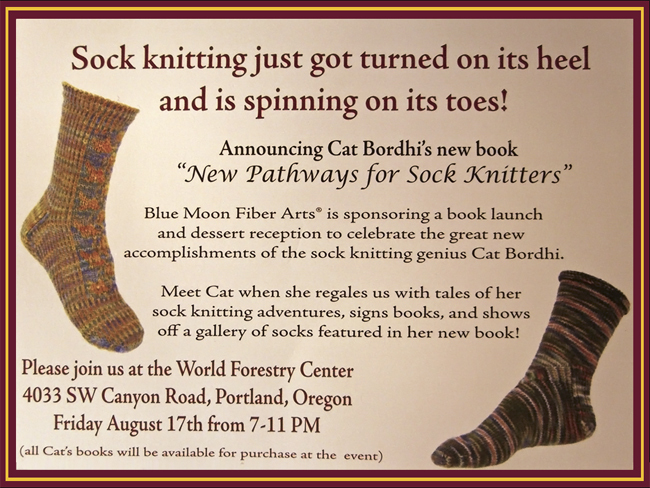 Cat will be talking about her knitting adventures, and will have samples of socks from the new book. Cat is a hoot, and I have seen her socks and they are wonders to behold. Come and show Cat how enthusiastic Northwest knitters are! Isn’t it perfect that Blue Moon, the lovely ladies that bring us Socks That Rock and other marvelous yarns, is hosting? Perfect!